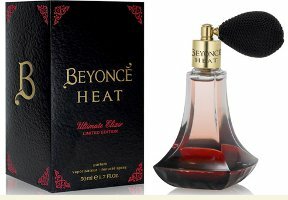 Beyoncé will follow her debut fragrance for women, Beyoncé Heat, with a limited edition flanker, Beyoncé Heat Ultimate Elixir. Heat Ultimate Elixir is a more concentrated variation on the original Heat; the notes include red vanilla orchid, osmanthus, cedar, amber, vanilla and tonka bean. I like the bottle. The notes seem nice. I like that it is more concentrated. I better go get this. It doesn’t seem half bad. I hope it is a bit less sweet — will be interesting to try. Saw this last night. I really can’t wait. Do all atomizers leak??? You mean bulb atomizers? In general I’d say if you have a bottle you use everyday and you’ll be using up in a relatively short amount of time then you can get away with using the bulb atomizer. Over a longer period of time you will have evaporation —so anything that’s stored for a while you’ll want a standard spray top or the screw on cap. Never ever ship anything with the bulb atomizer attached. Those darn bulb atomizers are so tempting! Ever see the one on Fifi Chachnil? So cute! –yet it’s sitting in the drawer with all the others…someday, when the bottles are empty of perfume—I’ll put colored water in them and display with the bulbs. At that price, I’d be surprised if the bulb atomizer was optional, but it’s worth checking. One option is to decant it into something else. Robin is right—it most likely comes with a screw on top that you remove to apply the bulb atomizer. I have a couple that came that way (and they were expensive enough that they could have included a darn spray top!) So this is what I do: using a pipette I fill a 10ml decant bottle and that’s for my everyday use—then replace the screw top, put the bottle back in its box and store with your other FBs (in this case under your bed is fine—most important it’s dark…unless there’s a heat duct under there? ) I’m such a terrible perfume hoarder and I’m so lazy that if I keep everything in its box: I’d never use them….so I make decants for myself. Important question: do you have any decant atomizers? I really think every perfumista should keep a supply of small bottles it’s truly a wonderful convenience. And they’re pretty inexpensive; easily had for $1 apiece or less—plus it’s so nice to be able to take your SOTD with you for re-spritzing later. They can evaporate pretty quickly. When I was in high school I had a bottle of Anais Anais EdP that I put in a bottle with a bulb atomizer sprayer. Within a couple of months the alcohol evaporated and about an inch of perfume oil was left. It was kind of shocking. I may be off a little on how much time it took for that to happen, but not much. I haven’t sniffed the first one yet. I have no idea what a ‘red vanilla orchid’ smells like but it sounds appealing. I think they’ve done a nice job with the packaging —the bottle is attractive and the black bulb atomizer really sets it off….too bad I’d never leave a bulb atomizer actually ON a bottle (goodness knows I have a whole collection of unused bulb atomizers! ) . But calligraphy B on the side reminds me of the B Natalie Portman wore when she played Anne Boleyn. Not that that means anything. It’s a sweet fruity musk. Hoping this one is woodier/darker, but we’ll see. I thought the original smelled like the love child of J. Lo’s Live Luxe and any LE Escada, and since I own one of the former and many of the latter I didn’t really see the need/desire for it. But I’d certainly try this one, especially if it isn’t quite as sweet. I also have a drawer with several bulb atomizers in it. I love the look and retro-ness of them, but just don’t want to chance it after a bottle of Curious went over in five months with the bulb atomizer while a spray bottle’s lasted a lot longer. I try to keep empty perfume bottles (you can get them dirt cheap off bottle/decant supply sites) around just in case. There’s a large bottle of Violetta di Parma en route to me as I type, and I believe it also has one of the same trendy atomizers, too. I do wish they could make ones that didn’t lead to evaporation, but can’t imagine how it would be done. Is it just me or does that entire ensemble look tacky as hell??? of course that has nothing at all to do with its tackiness level…. It’s tacky as hell….aaaand I like it! I just bought it TODAY at Macy’s! BEAUTIFUL bottle! THIS version is the answer to my prayers. I just sprayed a tiny bit on my arm and it’s sooo beautiful. It smells like a deeper, darker version of HEAT with a dash of black licorice, sweet nice peaches and Vanilla. THIS is the fragrance I think Sasha Fierce would wear. Beyonce Heat was for Beyonce and the Ultimate Elixir is for Sasha Fierce. This is a scent that you’ll wear for a night on the town. It’s everything I felt the first was missing, though I’m still obsessed with the first one.. I hope it gets nominated for a FIFI :). I hope you love this, Robin. I just really reallly love it! Sounds great, look forward to trying it! Yes, there are tons of them. I use pilotvials.com, but I am lazy and haven’t really shopped around in the last few years, so perhaps there are better prices elsewhere. Might be worth bringing up on an open thread to find out what stores other people like these days. You could also try a board search at MakeupAlley, it usually comes up there every so often too. NEW BEYONCE FRAGRANCE! BEYONCE HEAT RUSH! AHHHHH!